Programme for March and April meetings. Barry Kable delivered his annual report, outlining the many and varied activities of our Society in the past year. Rob Murray chaired the re-election of Barry Kable as President. Barry read out the new office bearers, and they were elected unopposed. Life Memberships were awarded to Bob Cross and John Higgins for meritorious service to our Society over many years. 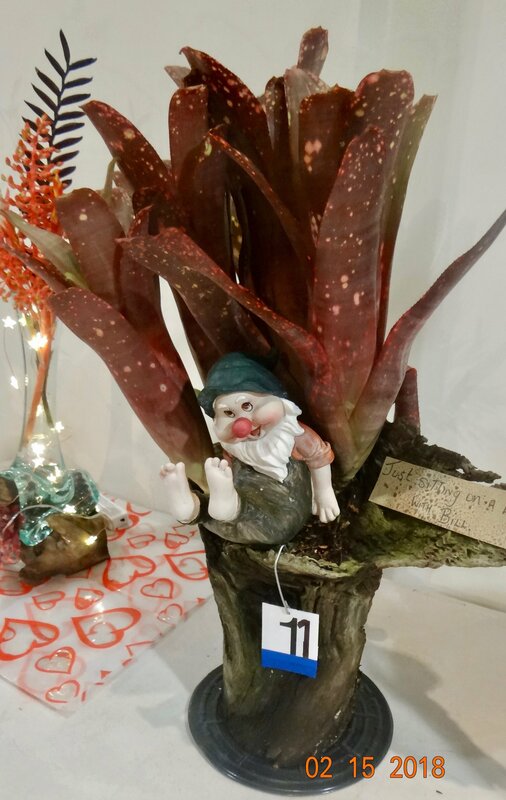 Bob Cross has a passion for bromeliads for over 30 years. He has an extensive collection, focussed on species. 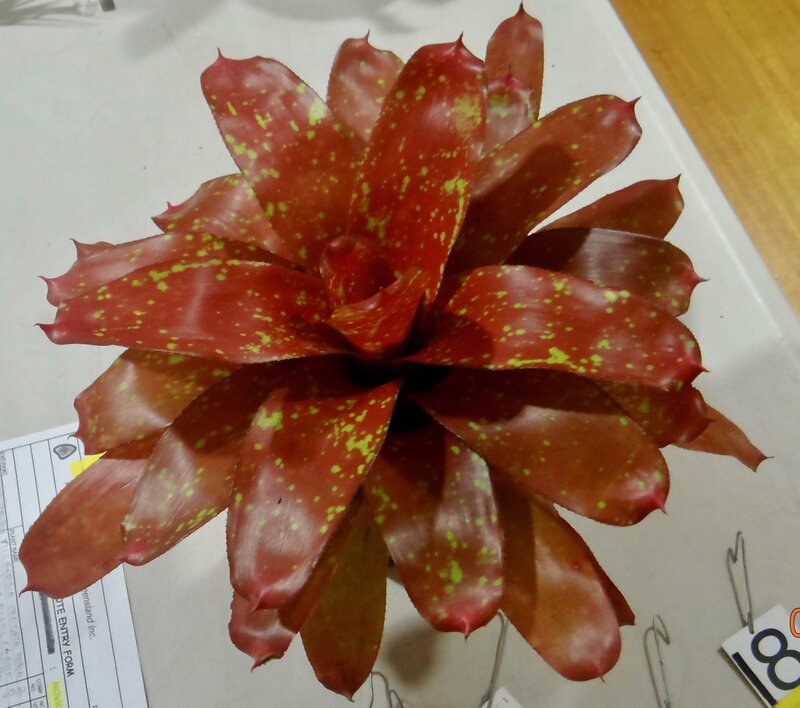 For many years, he has organised brilliant displays of bromeliads at the RNA Shows, Society Spring and Autumn Shows. He has served as President, editor, committee member, and other roles. He has opened his home to field days as far back as 1992, and acknowledged support from his wife Kath. Bob Cross accepting his Life Membership. 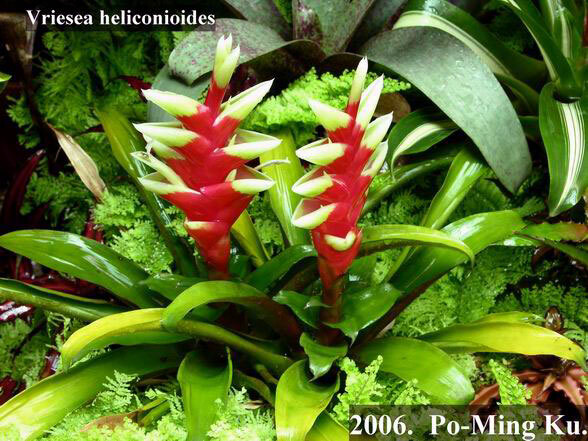 John Higgins has loved bromeliads for over 40 years, and has served on the committee starting in 1976. He was President 1989-1990 and again 2002-4. He has been involved in judging, organised the successful Australasian Brom Conference in Brisbane in 2002. 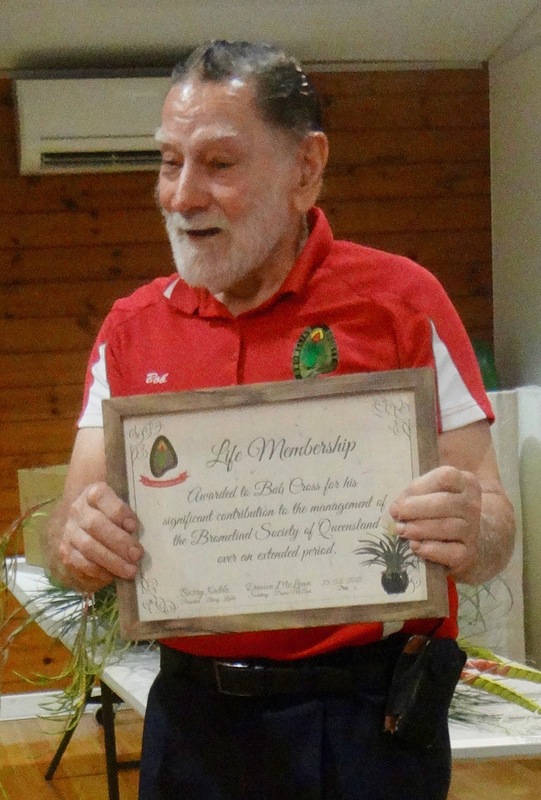 He was made a Life Member. He acknowledged the vital support of his wife Ruth. 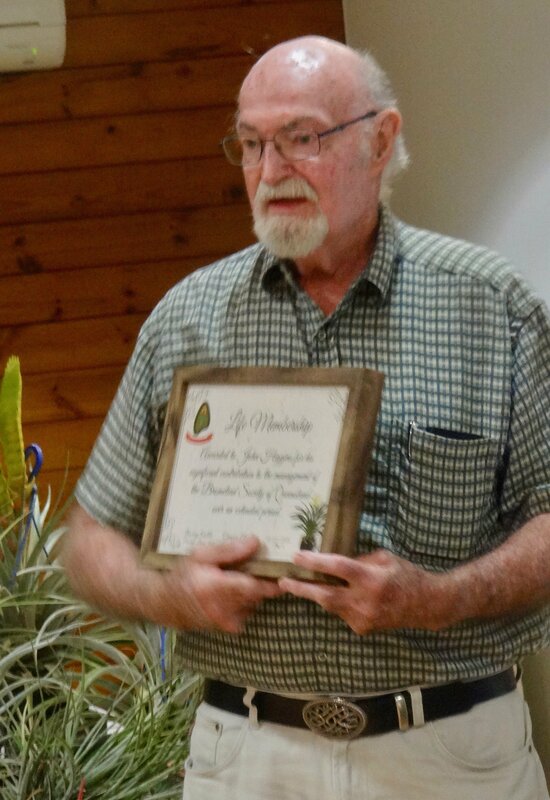 Roy Pugh was awarded a Certificate of Appreciation for his many years work in getting our journal Bromeliaceae published. He has been a proof reader, and was responsible for the distribution since 2002. The peak was in 2009 when 656 copies were sent out. 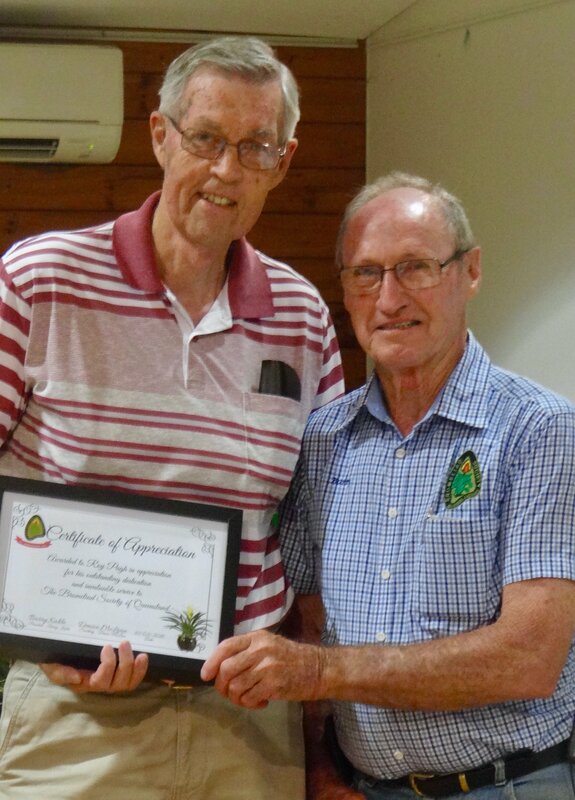 Roy (on left) receives his Award from Barry Kable. The Meeting started with The Information Session with Tom Isaac. T. seleriana had a pup he gently separated with a knife. 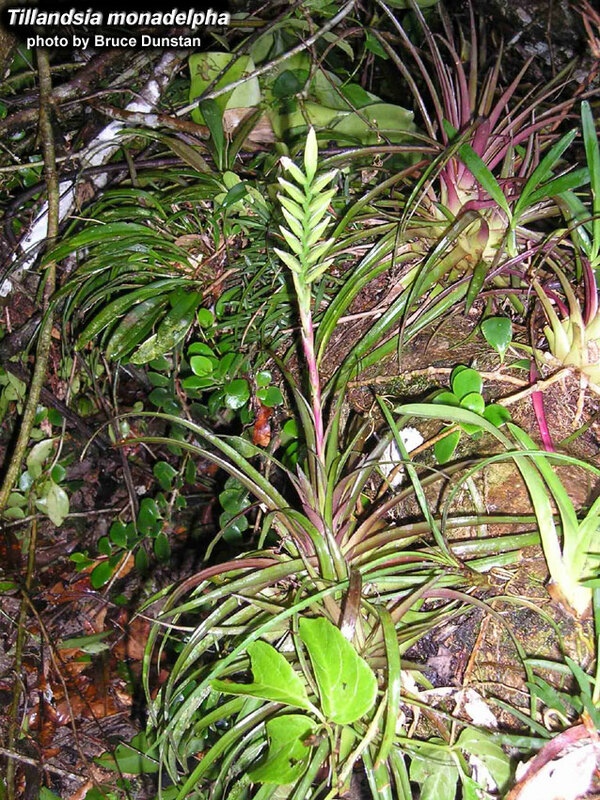 T. streptophylla (pictured lower left) had three pups at its base which were easily removed manually. Tom advises against removing leaves at the base. He recommends hanging the flowering plant upside down to maximise light exposure to stimulate growth of more pups. T. buchlohii (top right) had several pups along its stem which could be gently wiggled off manually. Tom sprays cinnamon water on bare areas left by pup removal (a solution of cinnamon powder and water) to prevent infection. 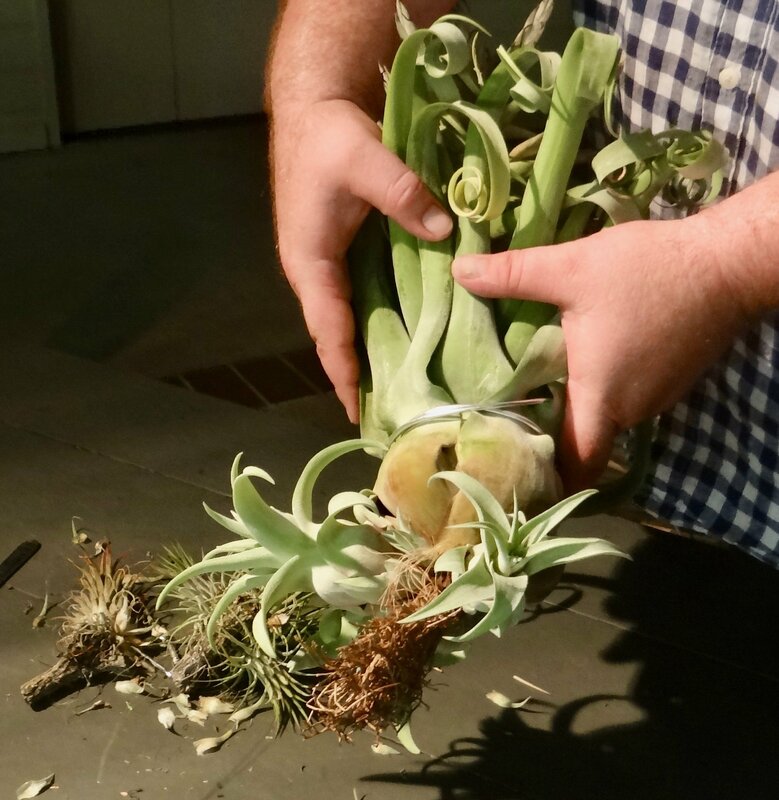 Tom uses keiki paste to stimulate new pups, especially T. xerographica and T. streptophylla. Keiki is the name of a baby orchid, and orchid growers us this paste. Thanks Tom for those useful tips. 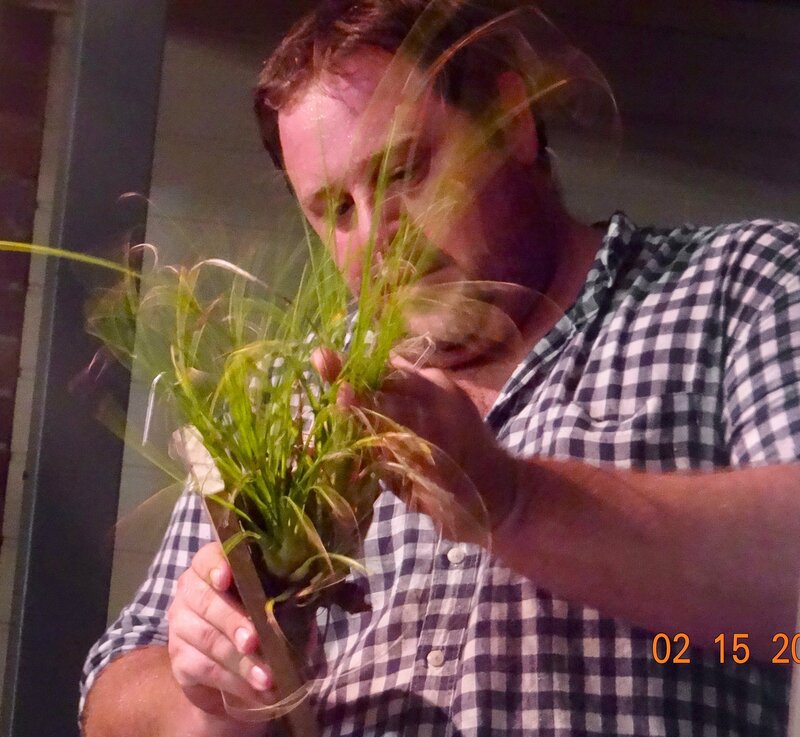 Guest Speaker was Bruce Dunstan on Tillandsia Diversity. 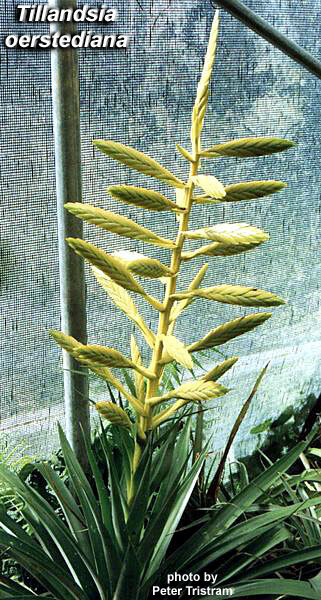 The taxonomy of bromeliads is changing daily, and at the time of his talk, Bruce reckoned their were 778 Tillandsias. 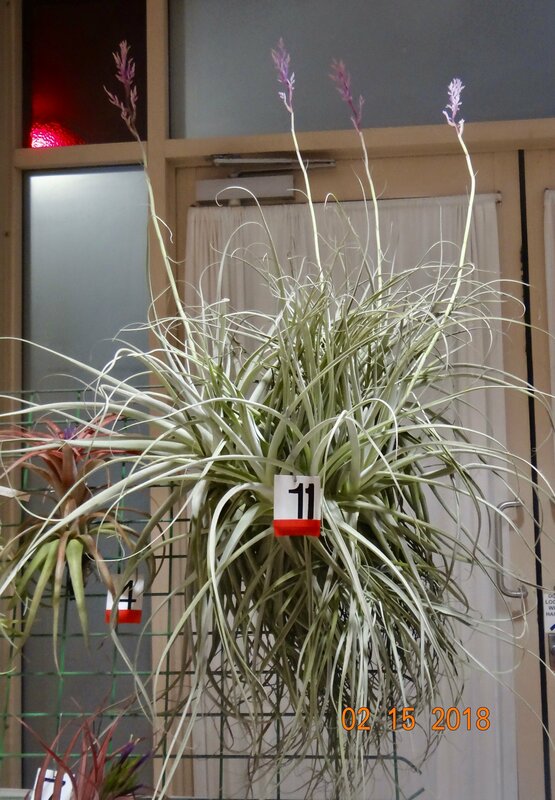 He presented a series of photos of Tillandsias. 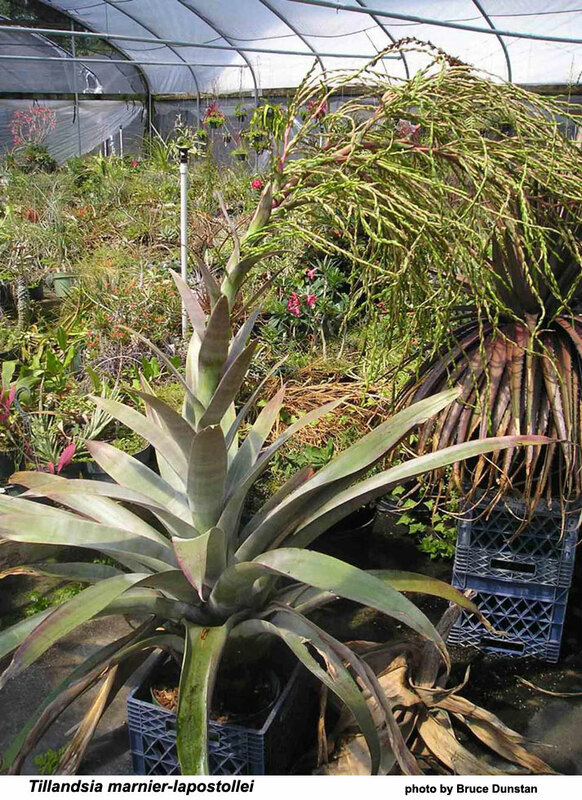 For Bruce, big is beautiful, and he started with some amazing large plants in bloom. 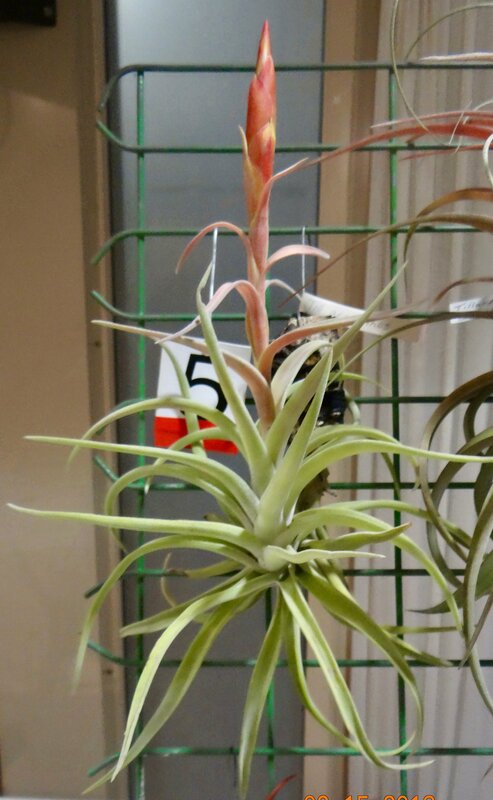 He confessed that it is only in the last year or so that he has shown any interest in the small Tillandsia ionantha! The Diversity of Tillandsias includes a wide range in sizes, a variety in leaf colour with beautiful silver/frosty leaves, colour of inflorescence, reproductive habits, tolerance of extremes of habitat and more. 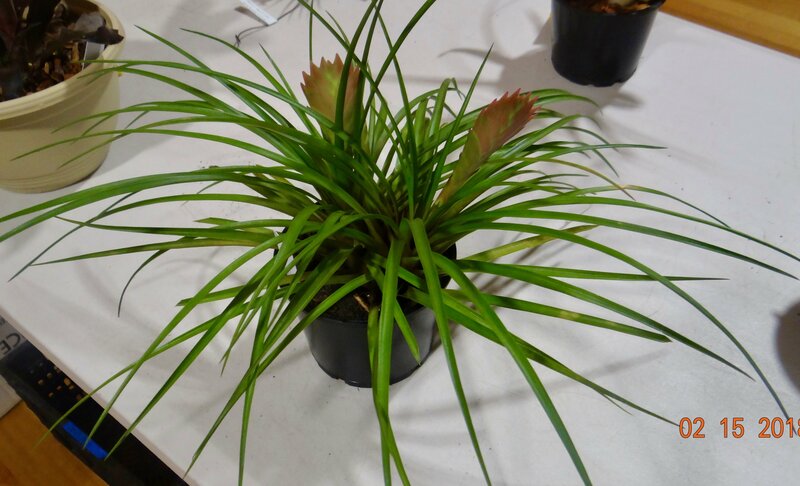 T. monadelpha is now Lemeltonia, has a tall spike, and comes from Central America and northern South America. 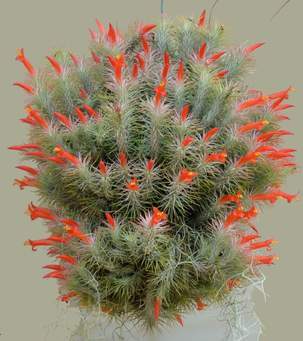 Tillandsia buceri has a stunning red inflorescence, has a new genus Mesobromelia. 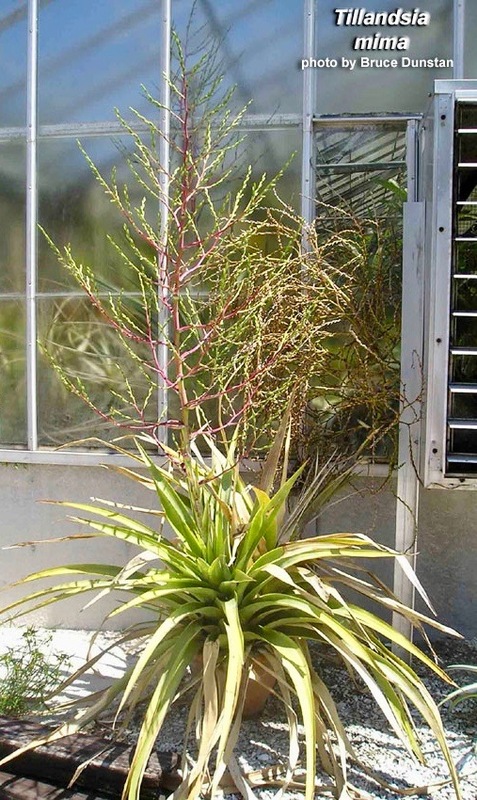 Vriesea heliconioides is now a Tillandsia heliconioides, due to recent DNA studies. Silvery foliage attracts many collectors. This is from trichomes, the distinctive anatomical feature on Bromeliad leaves enabling tolerance of prolonged arid conditions. Bruce showed a closeup of trichomes in Tillandsia funckiana. Tillandsia tectorum is very popular for it frosty leaves covered with trichomes. Some Tillandsias form stunning clumps, like this ionantha. 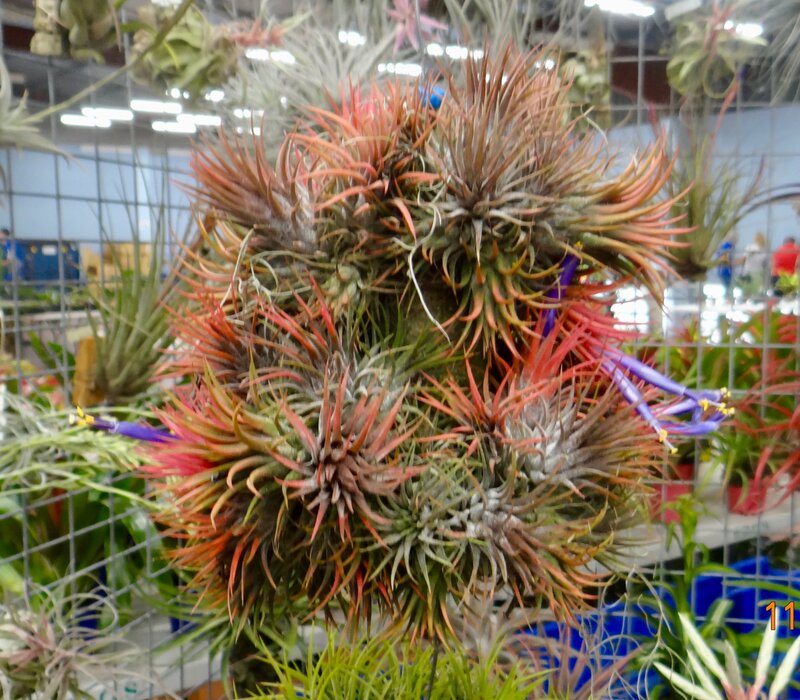 Tillandsia funckiana also forms beautiful clumps. Some Tillandsias thrive in very wet conditions too. T. rauhii is such a plant and has a rosette 1-2 m across. Tillandsia rauhii is a spectacular, huge growing Tillandsia. It takes many years to grow from seeds but the wait is worth it. Imagine a cliff dweller over a metre across that produces an inflorescence that approaches two meters, and has deep, black purple flowers for over a year! 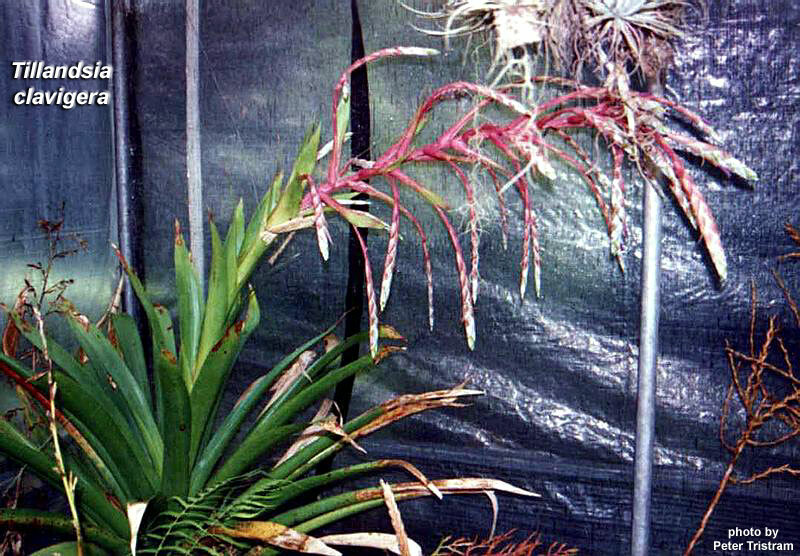 T. grandis throws a massive spike, is renamed Pseudoalcantaria grandis. 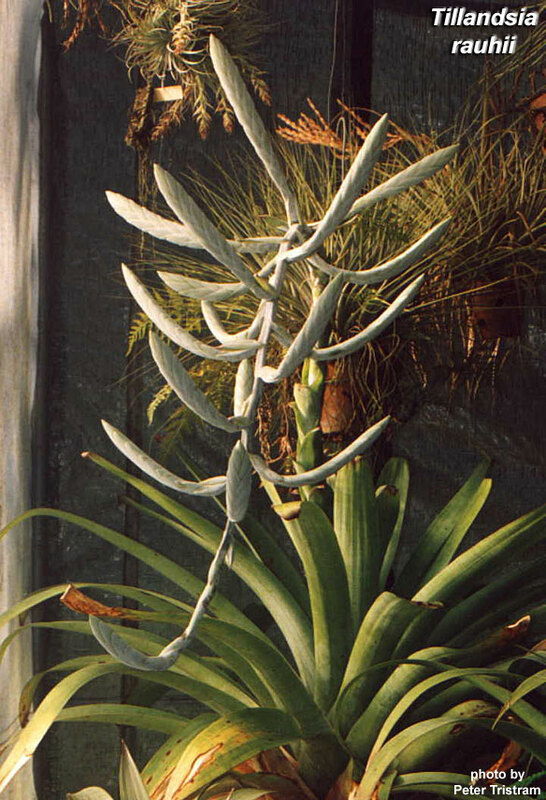 HE ABOVE PHOTOGRAPH shows Russell C. Mott, superintendent of the Cornell University Conservatory in Ithaca, New York, inspecting the buds of Tillandsia grandis. This plant was a gift of Mulford B. 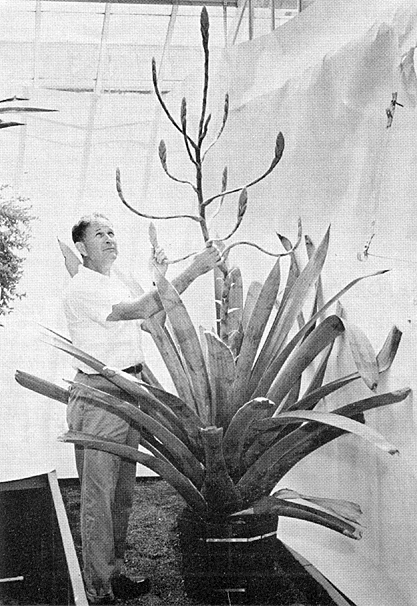 Foster, who brought it from his tropical garden in Orlando, Florida, in 1951. Originally, he had collected it at an elevation of 7,000 feet. 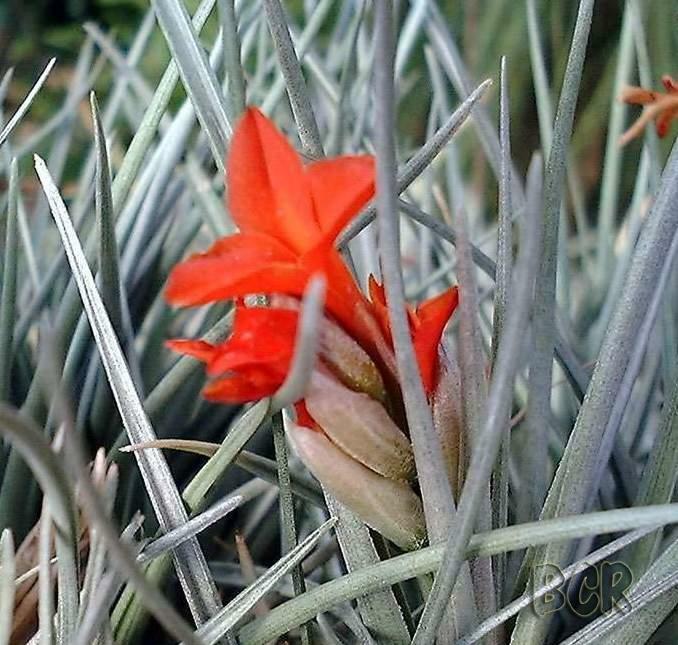 Tillandsia grandis is native to the mountains of Central Mexico and British Honduras. 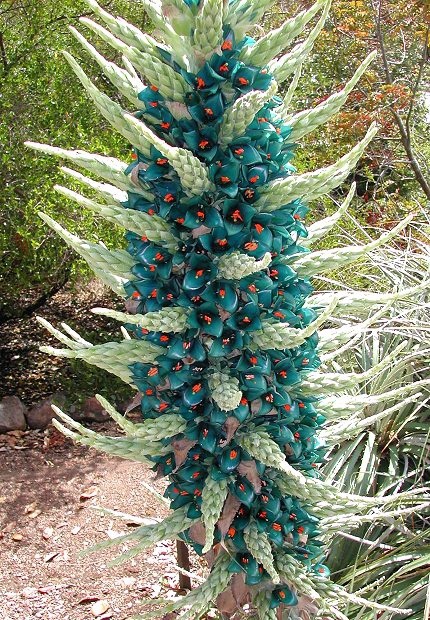 Even in its native habitat it may not flower until it is 20 to 25 years old and then produces a flower stalk that may reach a height of 15 feet. T. clavigera var pendula has a 1m rosette, and arching pink inflorescence. 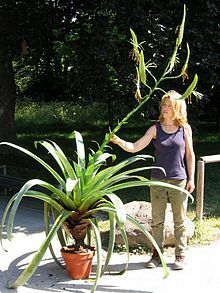 Tillandsia marnier-lapostollei has a 1.5m spike. T. mima has very large, succulent leaves, from Ecuador and Peru. T. oestediana from Panama has a 1.5m spike, is like a Christmas tree. 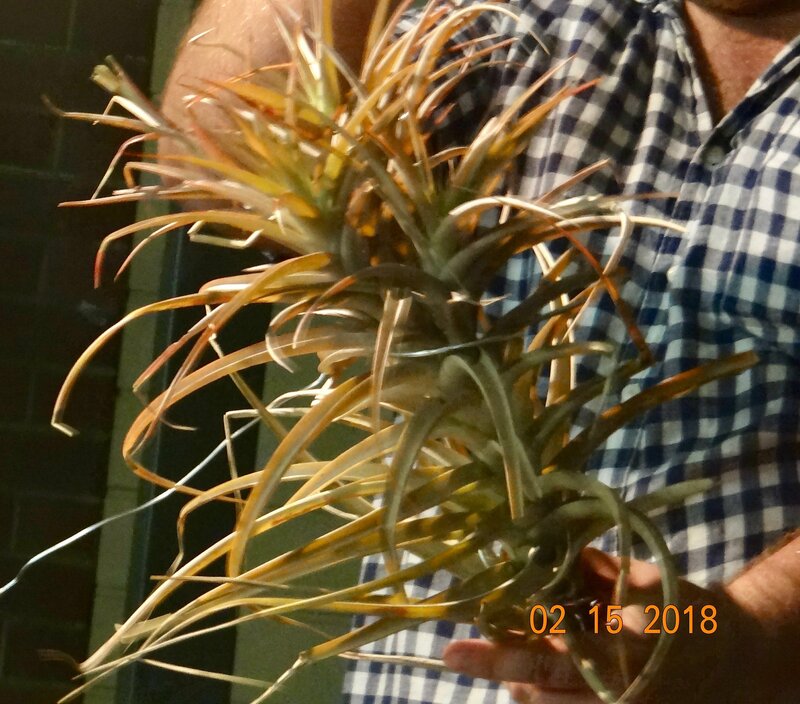 Bruce entertained us with another 20 or so interesting Tillandsias, demonstrating a deep knowledge of the genus, and an eye for the spectacular and unusual. Thanks again for a pictorial adventure. 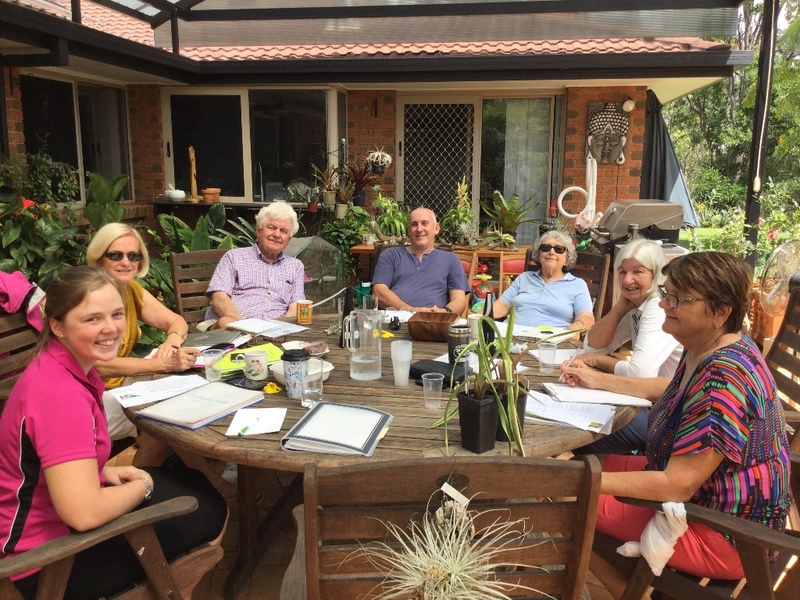 From the left, Becky Trevor, Pam Butler, Maxim Wilson, Peter Ball, Olive Trevor, Barbara Murray and Narelle Aizelwood at a Judges Training Day to maintain their skills as judges. 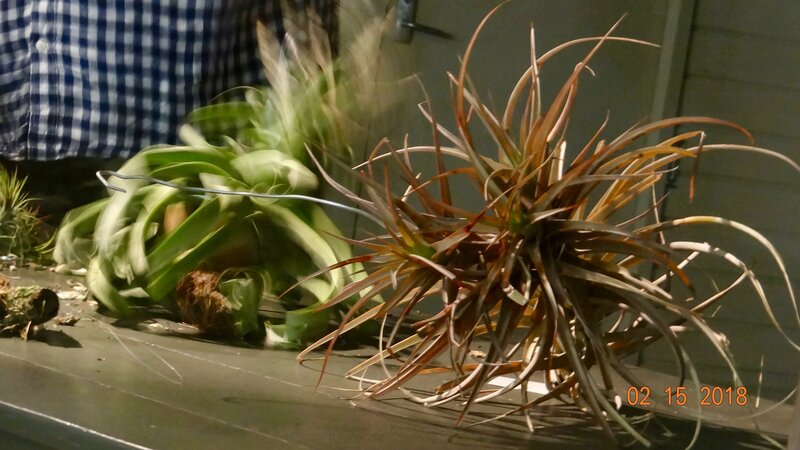 Tillandsia Seminar from 9am to 4pm. Sunday 4th March. 12-16 Young's Crossing Road, Bray Park. Sunday 4 March 2018, 9am to 4pm. 4pm Finish and clean up. 1st. Tillandsia ‘Mystic Flame’ from Alfonso Trudu. 2nd Neoregelia ‘Treasure Chest’ from Cameron Smith. Wallisia cyanea from Gilda Trudu. 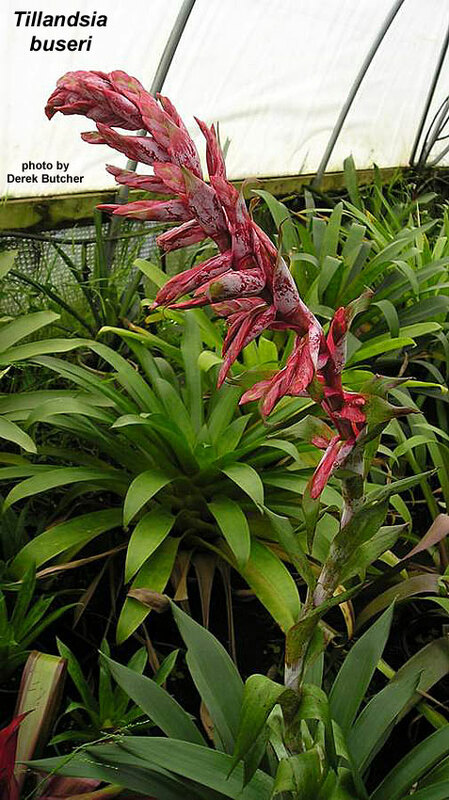 Cryptanthus ‘Don Garrison’ from Alfonso Trudu. Aechmea orlandiana from Cameron Smith. 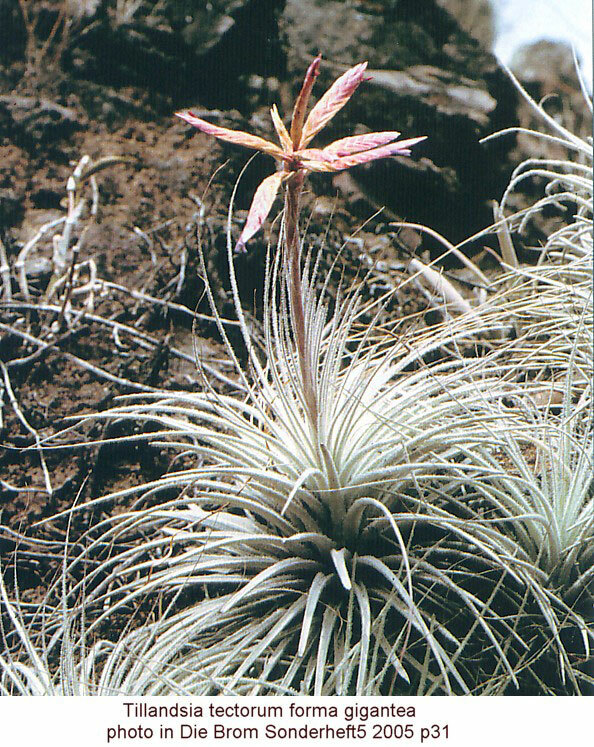 Tillandsia straminea from Greg Aizelwood. Billbergia ‘Don Lee’ from Greg Aizelwood. 2nd Tillandsia ‘Phoenix’ from Maxim Wilson. Tillandsia harrisii from Fred Thomson. Tillandsia multicaulis from Maxim Wilson. 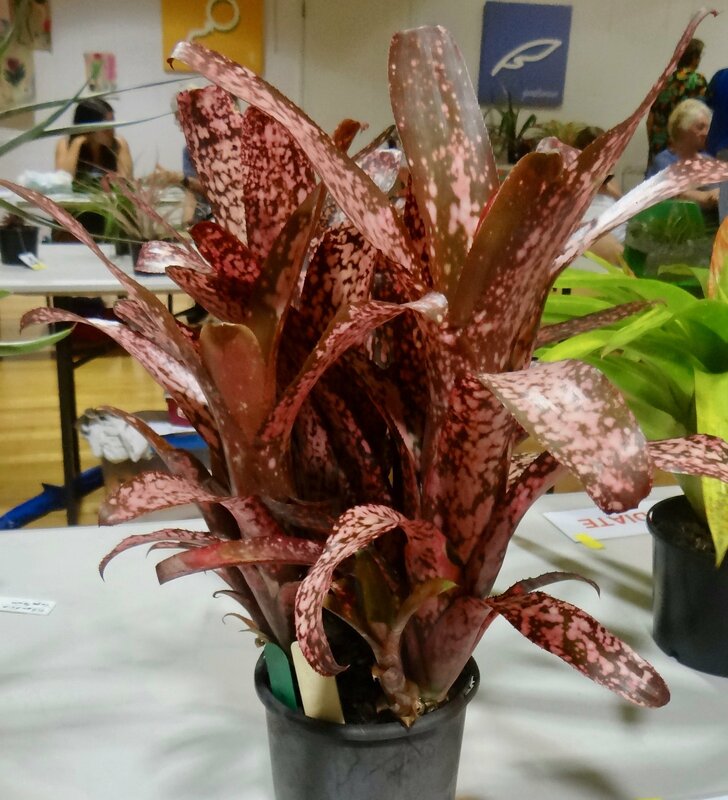 Billbergia hybrid from Livia Doidge. 1st Tillandsia ‘Bob’s Amigo’ from Barry Kable. 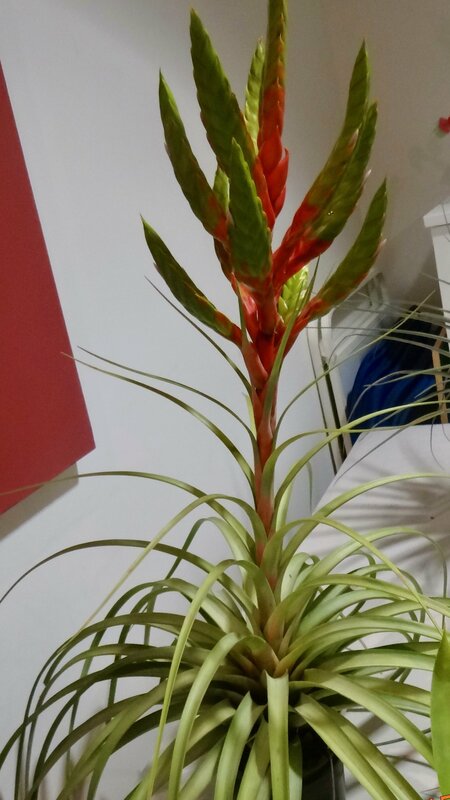 2nd Tillandsia straminea from Ron Jell. 3rd Tillandsia 'Ninderry' from Ron Jell. 1st ‘Sitting on A Log’ from Livia Doidge. 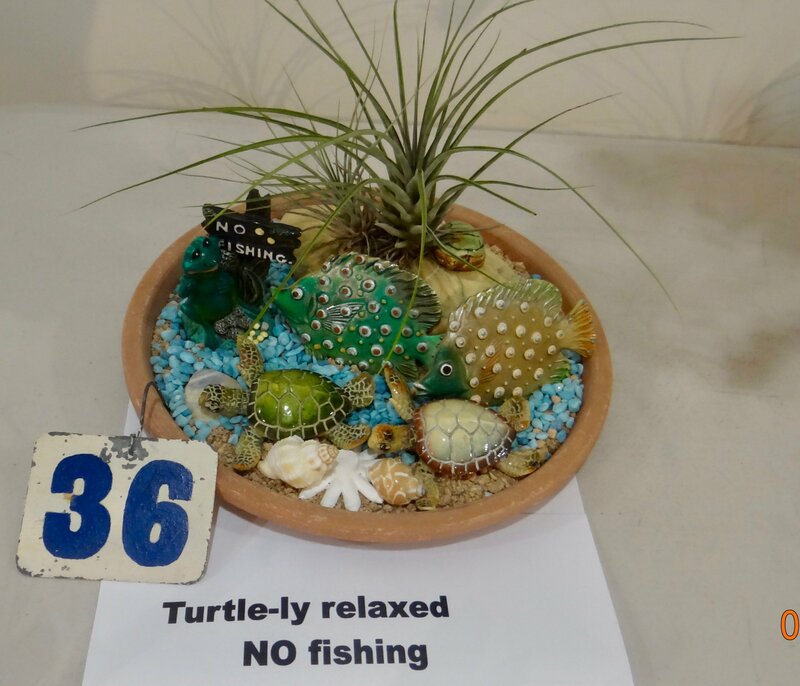 2nd ‘Turtle-ly Relaxed’ from Ron Jell. 3rd ‘Valentine’s Day, One Day Late’ from Janet Richter. Tillandsia 'Mystic Flame' from Alfonso Trudu. Neoregelia 'Treasure Chest' from Cameron Smith. Tillandsia 'Harrisii' from Fred Thomson. Tillandsia 'Straminea' from Greg Aizelwood. Billbergia 'Don Lee' from Greg Aizelwood. Tillandsia 'Bob's Amigo' from Barry Kable. 'Sitting on a Log' form Livia Doidge. 'Turtle-ly Relaxed' from Ron Jell. CONFIDOR is in the news! 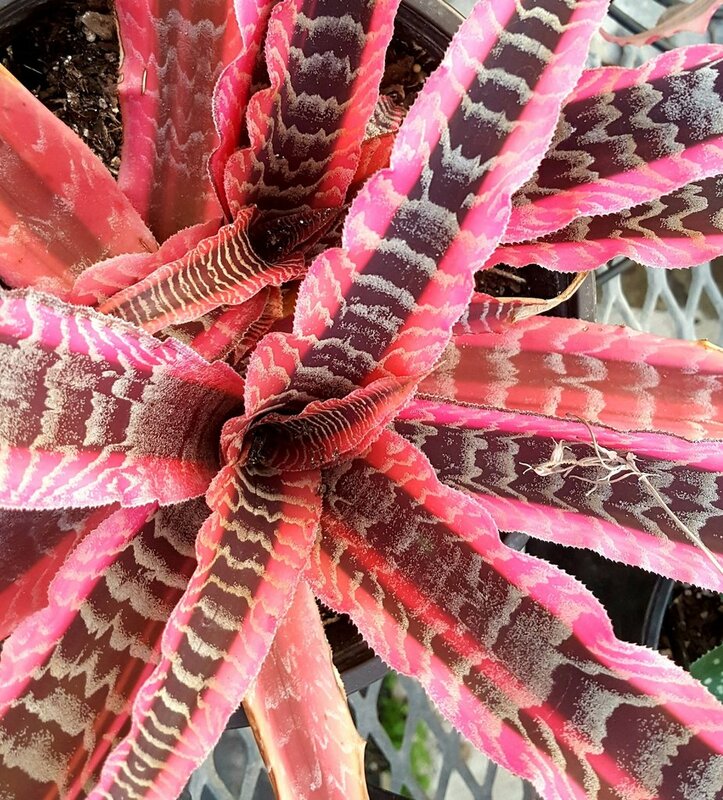 Plant of Month - Cryptanthus with Pam Butler. Guest Speaker - Photography with iPhone and iPad with Lisa Kurtz. Popular Vote commentary - Peter Ball. Show Mini Show - see the schedule below. Plant of Month - The 'Pricklies', Dyckia, Orthophytum and Puya with Barb McCune. Guest Speaker - Peter Tristram on Breeding Neoregelias. Popular Vote commentary by P. Tristram.